St. Michael the Archangel, loyal champion of God and His people, I turn to you with confidence and seek your powerful intercession. For the love of God, Who made you so glorious in grace and power, and for the love of the Mother of Jesus, the Queen of the Angels, be pleased to hear my prayer. You know the value on my soul in the eyes of God. May no stain of evil ever disfigure its beauty. Help me to conquer the evil spirit who tempts me. I desire to imitate your loyalty to God and Holy Mother Church and your great love for God and people. And since you are God's messenger for the care of his people, I entrust to you this special request: (Mention your request). St. Michael, since you are, by the Will of the Creator, the powerful intercessor of Christians, I have great confidence in your prayers. I earnestly trust that if it is God's holy Will, my petition will be granted. Pray for me, St. Michael, and also for those I love. Protect us in all dangers of body and soul. Help us in our daily needs. Through your powerful intercession, may we live a holy life, die a happy death, and reach heaven where we may praise and love God with you forever. Amen. 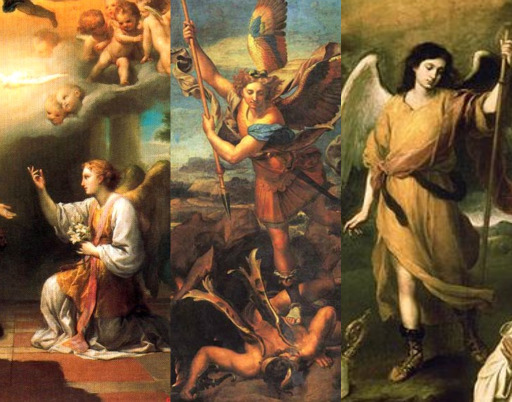 St. Gabriel the Archangel, I venerate you as the "Angel of the Incarnation," because God has specially appointed you to bear the messages concerning the God-Man to Daniel, Zechariah, and the Blessed Virgin Mary. Give me a tender and devoted Mother, more like your own. I venerate you also as the "strength from God," because you are the giver of God's strength, consoler and comforter chosen to strengthen God's faithful and to teach them important truths. I ask for the grace of a special power of the will to strive for holiness of life. Steady my resolutions, renew my courage, comfort and console me in the problems, trials, and sufferings of daily living, as you consoled our Savior in His agony and Mary in her sorrows and Joseph in his trials. I put my confidence in you. St. Gabriel, I ask you especially for this favor: (Mention your request). Through your earnest love for the Son of God-Made-Man and for His blessed Mother, I beg of you, intercede for me that my request may be granted, if it be God's holy Will. Pray for us, St. Gabriel the Archangel. That we may be made worthy of the promises of Christ. Let us Pray. Almighty and ever-living God, since You chose the Archangel Gabriel from among all the Angels to announce the mystery of Your Son's Incarnation, mercifully grant that we who honor him on earth may feel the benefit of his patronage in heaven. You live and reign for ever. Amen. Holy Archangel Raphael, standing so close to the throne of God and offering Him our prayers, I venerate you as God's special Friend and Messenger. I choose you as my Patron and wish to love and obey you as young Tobiah did. I consecrate to you my body and soul,all my work, and my whole life. I want you to be my Guide and Counselor in all the dangerous and difficult problems and decisions of my life. Remember, dearest, St. Raphael, that the grace of God preserved you with the good Angels in heaven when the proud ones were cast into hell. I entreat you, therefore, to help me in my struggle against the world, the spirit of impurity, and the devil. Defend me from all dangers and every occasion of sin. Direct me always in the way of peace, safety, and salvation. Offer my prayers to God as you offered those of Tobiah, so that through your intercession I may obtain the graces necessary for the salvation of my soul. I ask you to pray that God grant me this favor if it be His holy Will: (Mention your request). St. Raphael, help me to love and serve my God faithfully, to die in His grace, and finally to merit to join you in seeing and praising God forever in heaven. Amen.